Born in South Vietnam, Master YongHua came to the United States in 1973 to attend college. He earned a BS degree in Mathematics from the University of Minnesota and an MBA degree from the University of Chicago. After working in the corporate world for decades, he decided to leave the home life to study Chan under Great Master XuanHua, 宣化 Tuyên Hóa, in 1995. 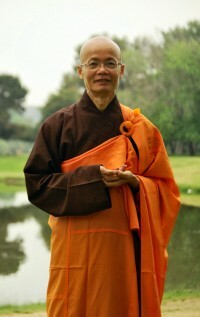 In 1999, he became fully ordained under Master Mãn Giác 滿覺. He then went to Taiwan to study Chinese and the Vinaya (the Buddhist rules of morality) for two years. He returned to the United States in 2001 and practiced in seclusion until 2005, when he started teaching Chan and accepting disciples. Master YongHua is the founder of Bodhi Light International, Inc (BLI) - a non-profit religious organization dedicated to benefiting all living beings through the teachings of Mahayana Buddhism. Through BLI, Master YongHua has been offering free programs and retreats for over ten years. In 2012, Master founded Lu Mountain Temple, which became BLI’s home base in Rosemead, CA. Lu Mountain Temple currently offers Chan meditation programs every Saturday, and Buddhist Dharma Assemblies on Sundays. Master YongHua also lectures on Mahayana Sutras every weekend. And every year, Master hosts a total of 10 weeks of Chan meditation retreat and 2 weeks of Buddha recitation retreats, held in the Summer and Winter. There are currently 11 monastic disciples training under Master YongHua, and many more lay students, who come from over 15 different nationalities and range in age from 1 to over 80. Although they have very diverse backgrounds, Master’s disciples share a common passion for cultivation, hoping to realize their fullest potential by devoting their lives to the service of others. Master YongHua provides individualized guidance to help each person find the methods that are most appropriate to their current cultivation level. In his lectures, Master YongHua devotes a significant amount of time to answering questions. This allows him to tailor his teachings to the needs of individual students, many of whom have attained high levels in their meditation practice and have seen significant improvement to their health and personal relationships. Master YongHua’s teachings can also be found on Facebook and YouTube.